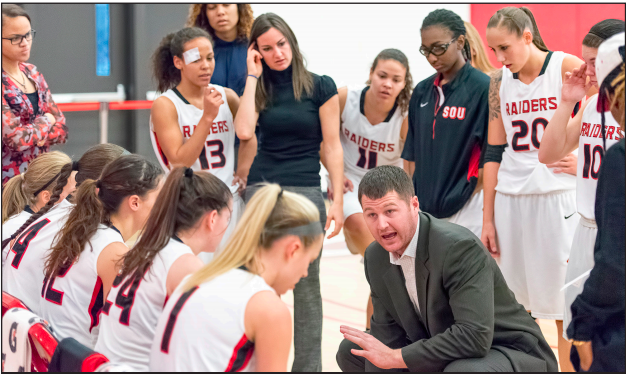 The Southern Oregon University women’s basketball team has been crushing teams at home this season, but this dominance honestly can’t be overstated. With Saturday evening’s 111–33 thrashing of the Walla Walla Wolves, the Lady Raiders average margin of victory in seven conference games at Ashland High School this season moved to a whopping 45.8 points. In the same amount of road CCC games, the Raiders have outscored opponents by 25.8. They have now scored 100 or more in four of five games and seven total times for the season. After the starters established a 14 point lead in the 1st quarter, the bench pushed this to 61–20 at halftime. The Wolves were held to 5 points in the second quarter, and were forced into 21 turnovers for the 1st half. The second half was more of the same, as the Raiders held their opponent to just 13 points, while scoring 50 more of their own. SOU forced 31 turnovers and scored 72 points off them for the game. Overall, six players scored in double figures led by reserves Majerle Reeves, Erin Houston, and Emily Peters with 12 points apiece, and Courtney Setzer with 17. Ashley Claussen and Carly Meister each scored 12, though most of their work came in the first quarter. In fact, none of the starters played more than 11 minutes, only playing about three minutes each in the second and third quarter, and none in the fourth. With the win, the lady Raiders move to 21–1 overall and 14–1 in CCC play. Next week is an important one for SOU as they face off with Oregon Tech on Tuesday and Eastern Oregon on Saturday at Ashland High. These teams are in second and third in the conference, and Eastern Oregon is the only team to defeat the Lady Raiders this season. Close games are often won in key few minute stretches, and SOU’s depth may just become prominent as they gear up for the postseason.